On July 28th the Reno Jazz Orchestra (RJO) will present “New Orleans, A Night in the Big Easy” as a part of Artown. It seems a perfect match as Reno’s 150th anniversary coincides with New Orleans’ 300th anniversary! New Orleans’ rich culture results from a long history that today’s column will present. Founded in 1718 by the French, the original city was centered on high ground where Jackson Square is today. Four years later a hurricane destroyed most of the city and when rebuilt streets were laid out in a grid pattern creating what is now the French Quarter.In 1763 the French ceded it over to the Spanish only to regain control forty years later and shortly thereafter sold to the United States as part of the Louisiana Purchase. During all this time the colonists practiced slavery of both local indigenous peoples as well as slaves imported from Africa. The mix of European, Latin American, and African cultures, a true melting pot, provided fertile ground for music. Jazz in particular. Tourists flock to Mardi Gras festivals (135 years!) and the Jazz and Heritage Festival to partake in the Big Easy lifestyle. 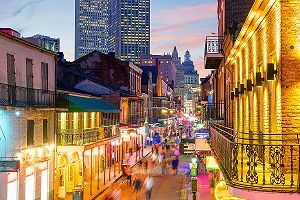 We are all familiar with the night life of Bourbon Street and the French Quarter, but it was just north of the French Quarter that jazz was born. New Orleans was the only city to allow slaves to gather in public, primarily in Congo Square, to play their native African music. 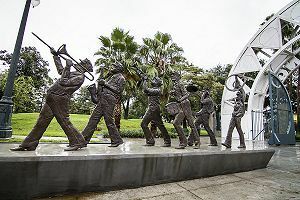 Congo Square, now a part of Louis Armstrong Park, is located in the Treme’ district which borders the French Quarter to the north. Treme’ is America’s oldest black neighborhood where, even during slavery, African Americans could purchase real estate. It is no surprise Treme’ is considered the birthplace of jazz and to this day a hotbed of New Orleans music. Treme’ is also known for second line parades, a tradition unique to New Orleans. They are held by clubs with the oldest being the Young Men Olympian Junior Benevolent Association founded in 1884. It is a festive parade featuring a brass band. The first line or main line is the club members with the parading permit and the brass band. The second line are those folks who follow the band to enjoy the music and to walk, dance, twirl parasols, and wave handkerchiefs. You will see a second line most Sundays with breaks for holidays and the heat of summer months. The second line is a spin off from a “jazz funeral”, where the procession is somber on the way to the cemetery and festive on the way back. New Orleans music is strongly influenced by Acadiana, home of Cajun, Zydeco, and Delta blues. It is the heart of French Louisiana consisting of 64 parishes (counties) that are home to a variety of cultures. Cajuns are descended from 18th century Acadian exiles from Nova Scotia and surrounding provinces after the French and Indian War (1754-1763). In the 1700’s the term Creole was used to differentiate those born in Louisiana as opposed to born in their mother country. It means “native-born” and applied to those descended from inhabitants during the French or Spanish rule. Acadiana is also the home to Native American tribes and southeast Asian refugees. You cannot have a cultural discussion about the Big Easy without talking about New Orleans Voodoo. Voodoo was brought to Louisiana by enslaved West Africans as early as 1719. Though a French colony, a 1731 census revealed there were twice as many African slaves than French settlers. With such a small number of settlers the enslaved Africans were kept in large groups which allowed them to continue their African culture and religion. Also, under the French code, families were recognized and it was prohibited to sell children under the age of fourteen away from the family. This differs from the north in which slave families were split apart and sent to various plantations. Voodoo is based in spirit and ancestor worship with the belief that our ancestors still influence our lives. Rituals revolve around singing songs that have been passed down for hundreds of years. Each of the four phases of the ritual has a specific song intended to open the gate between the spirit world and human world and invites the spirits to inhabit ritual participants. Voodoo practitioners wear amulets to ward off evil and bring good luck. Gris-gris is the most well know and is a small cloth bag containing a number of small objects to protect the wearer from evil or bring good luck. Originally from Ghana, gris-gris was decorated with Islamic scripture. Over the many years Catholic church elements began to be integrated into voodoo. The image of Catholic saints are now used to represent spirits that act as mediators to the human world. Voodoo queens are powerful community leaders who preside over the rituals and make a living selling gris-gris, magical powders, and invoke spells to cure ailments and destroy enemies. Marie Laveau is the most well-known. Practicing in the mid 1800’s her rituals on the shore of Lake Pontchartrain would attract thousands of black and white New Orleanians. Her tomb is still visited and offerings of pound cake left to expedite favors requested of the voodoo queen. There are also voodoo kings and in fact singer/songwriter Doctor John borrowed his name from a 1800’s king. Doctor John was an excellent healer with stories that he had the ability to resuscitate patients close to death. This lead to the Louisiana’s zombie myth! That is my brief overview of the rich cultural history of New Orleans also known as The Crescent City, The City that Care Forgot, Nawlins, and of course the Big Easy. Next month’s column will feature its music and musicians. So let’s get ready for Mardi Gras in July and “laissez le bon temps rouler!’ (let the good times roll).